We all know that winter is truly here: the cold weather has swiftly approached, it's already the final month of the year and everyone is putting up their Christmas decorations. I am so excited for Christmas this every year, and love to find new glittery beauty products to make my face sparkle all winter-round. 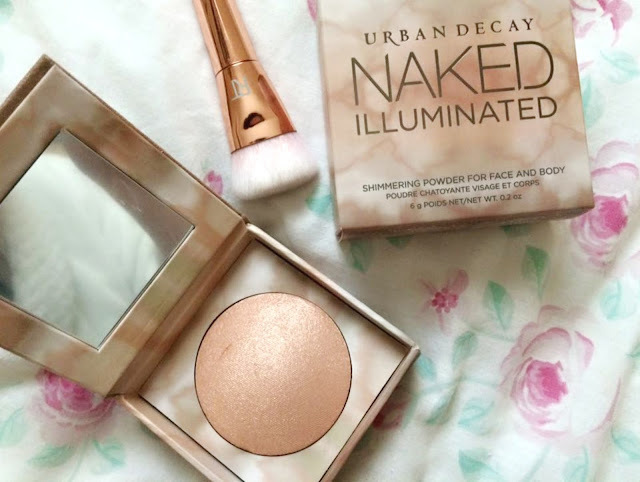 This year I finally purchased one of many beauty bloggers favourite highend highlighters - the infamous Urban Decay Naked Illuminated Powder in AURA!!! I couldn't resist adding another gorgeous highlighter to my collection and even better, it completely unique to any that I already own. 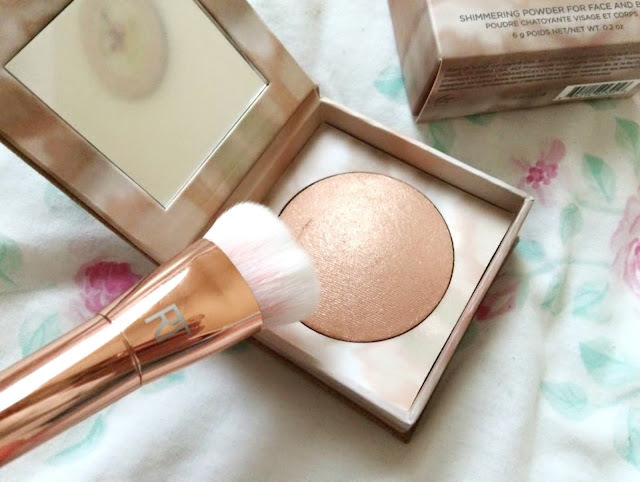 Encased in a chunky, champagne coloured compact, this peachy, golden baked glitter ball had me in awe; it was definitely my favourite shade out of the three on offer (Lit + Luminous)! There is soooo much sparkle through product and the formulation is insanely pigmented so a little goes a VERY long way - using the contour brush from the Real Techniques Bold Metals range provides precise application to the cheekbones followed by a fluffy brush to thoroughly blend and avoid that 'glitter ball mess' look. The peachy tone in Aura majorly contributes to the overall Christmas vibe to the product - without that peachy glow, my complexion would be completely washed out and their would be no colour on my cheeks to give any depth to my makeup look. Something I have become really fond of in the makeup world recently is the definition you can form by applying different colours to areas of the face. Contouring has impacted insane amounts in the makeup industry this year - it is the highlighters turn to take the limelight in 2016, does anyone else agree?! Being a performer, I also bought this product as an added bonus because it states that you can use it to illuminate your body too. This would be amazing on the collarbones/arms for my dance/theatre shows - I can imagine it would catch the stagelights wonderfully. Sorry for my lack of posts and absence over the past month. I will try and stay posting as much as possible - A levels are the worst!!! Comment below if you love wearing glitter/sparkle in Winter just like me! 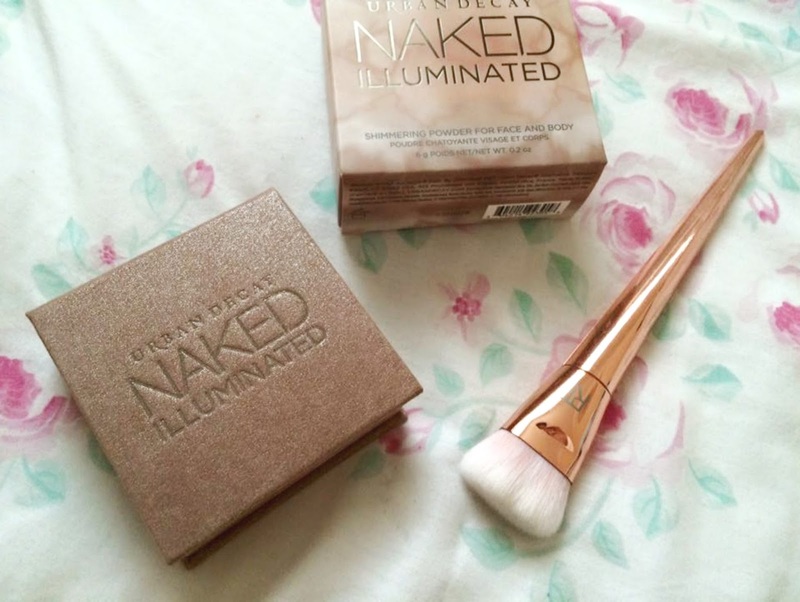 I've not actually seen anyone talk about this product before but it looks gorgeous! 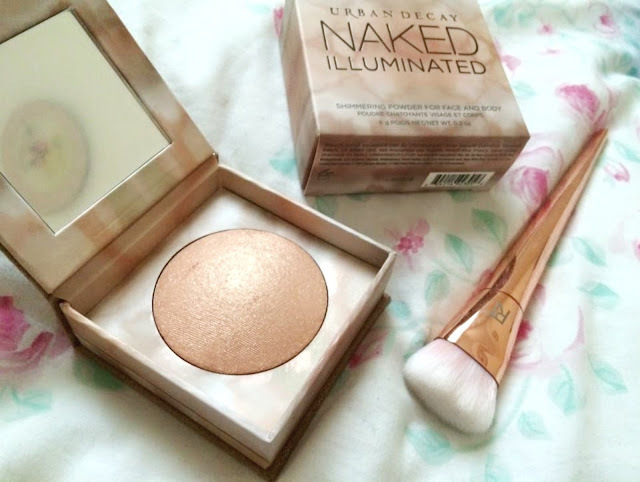 This is my favourite highlighter of all time! I just love it soooo much!! I love a good highlighter and this one really has got my attention now ! I've been looking for a good highlighter/illuminator, been debating a lot but this one looks really good! Might have to invest!